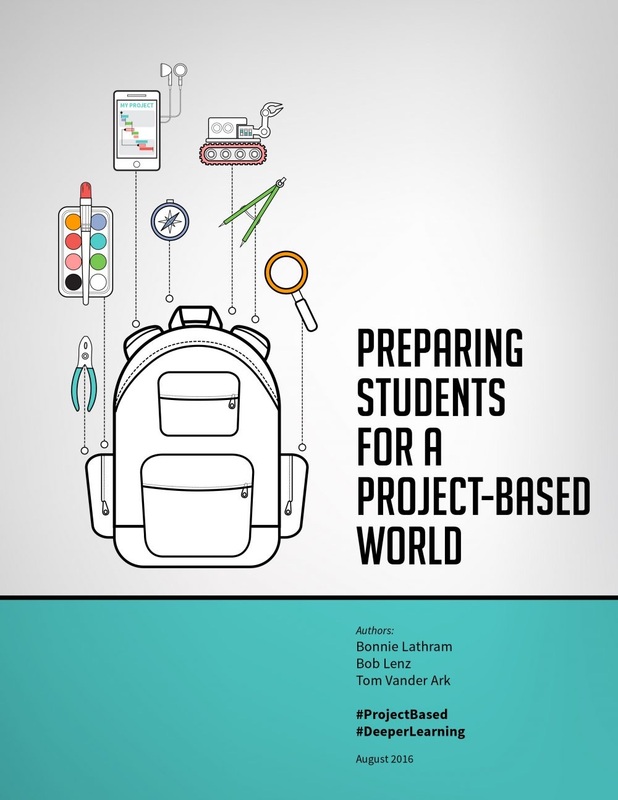 Preparing Students for a Project-Based World by Bonnie Lathram, Bob Lenz, and Tom Vander Ark spells out the rationale for introducing project-based learning as an excellent way to prepare students for college and careers. It is the first of three reports about the new economy and inequities in student preparation. The next two parts will deal with preparing teachers and students for a project-based classroom. The new economy requires a lot from young people. The bar is higher and the rules have changed in five ways. 1. Anyone who can access the Internet can learn to code, build and app, and start a business. This makes competition much greater. 2. The pace of technological change requires continuous learning. 3. As robots take over routine tasks, non-routine work is organized into projects. 4. Soon 40% of workers will be freelance and people employed by companies will move frequently. 5. Value is produced by initiating and sustaining complex work applying design and problem-solving skills. As a result, we need to reimagine how we teach students and how we organize schools. Students need to use their own interests and passions to grow their skills, master core academic content, and learn how to collaborate with others. One way to do this is to give all students access to high-quality project-based learning. For most workers, a series of projects will mark their career. There is also an increase in gigs, which are short-term routine tasks requiring low-skills. The classic example here is Uber where anyone with a car and a drivers license can earn a modest income. Better paying jobs are just the opposite since they usually involve long-term projects, require much more skill, and pay much more. Today’s youth also has to beware of jobs subject to automation. The classic example here is tax preparation. Policy changes associated with No Child Left Behind and Race to the Top have not reduced gaps between black and white performance. Nine out of ten children from the bottom of the income ladder who graduate from college move to a higher economic bracket. Being poor, however, is an impediment to getting the education that can lift you out of poverty. Most of the jobs created since the last recession have gone to people with at least some college education. Higher college costs and stagnant wages have lowered the return on college investments so don’t go until you are ready and don’t leave without a degree. Technological and economic change results in a very different job market for students to face. There are six ways to prepare for a project-based world and it is vital that teachers facilitate all of them. 1. Look for real-world internships. 2. Get real-time feedback, not just grades. In your career you will get feedback so get ready for it. 3. Learn how to collaborate. 4. Project results need to be communicated so work on communication skills including public speaking. 5. Personalize your learning. This will involve applying the skills learned elsewhere. 6. Learn about project management and team leadership. Project-based learning is one way to support deeper learning outcomes. They should be demanding and require a public audience. Essential project design elements include: a focus on student learning goals and standards, meaningful problems and appropriate levels of challenge, an extended process, a real-world context, student voice and choice, time for reflection, opportunities to critique and revise, and a public presentation. This report includes exemplars using several project results. This chapter ends with several fallacies associated with traditional non-project-based education. These include: memorizing content is all that’s necessary, more homework increases rigor but PBL is not rigorous, and PBL only works for white middle class students. The authors claim that PBL allows students to learn and master content knowledge, demonstrate and apply knowledge and skills, and learn how to learn as they transfer knowledge to new and different contexts. The authors bios are included at the end of this document. Bonnie Lathram is a Director at Getting Smart where she leads large-scale education initiatives. Bob Lenz is the Executive Director of the Buck Institute for Education. Tom Vander Ark is CEO of Getting Smart and a partner at Learn Capital, an education venture fund. You can follow them on Twitter at @belathram (Bonnie) @pblbob (Bob) and @tvanderark (Tom). This entry was posted on Monday, October 3rd, 2016 at 7:15 am	and is filed under Book Summaries, Education Books, Leadership Books. You can follow any responses to this entry through the RSS 2.0 feed. You can leave a response, or trackback from your own site.